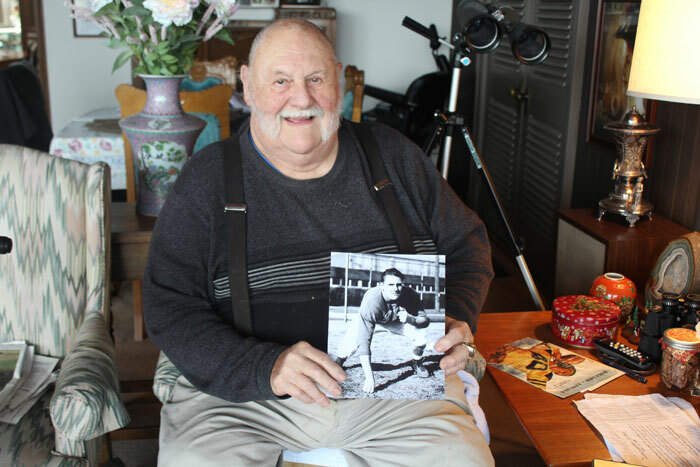 Photos by Danielle Chastaine: Magnolia resident Monty Holmes, 89, holds an old high school photo of himself when he played right guard for Ballard High School in 1947. Despite pushing 90 years old, Magnolia resident Monty Holmes still exercises every day and tries to keep in good physical shape. "I still have six-inch guns," Holmes said, pointing to his biceps. Holmes' habit of exercise has stuck with him since his football days, when he played for multiple local Seattle teams. Football is the reason for his two bad knees, but his love for the sport has never faltered. In fact, talking about it sometimes brings him to tears. “There's something about being on a team and knowing you all have each other's back," Holmes said. Holmes began his football career his junior year at Ballard High School in 1947, back when the players wore leather helmets and little padding. He was a 200-pound, six-foot-tall right guard. 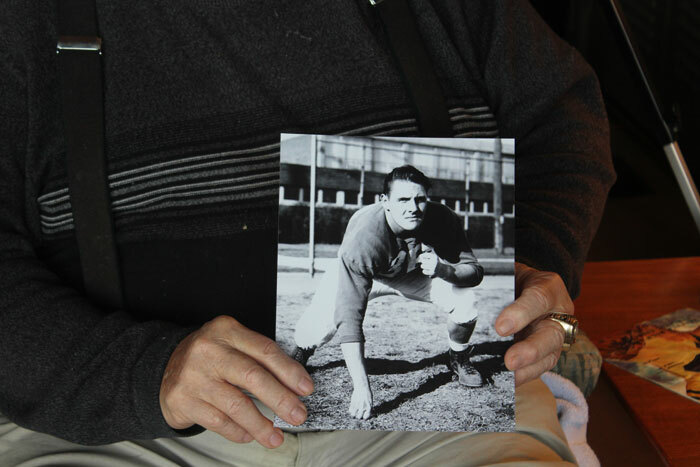 During the city championship game in '47, Monty tore his ACL and dislocated his right knee. He took a job at the Athletic Supply store, which was the largest sports equipment store in the area, until he graduated high school in 1949. He attended Everett College on a football scholarship after high school but tore the same ACL ligament again. “I took time to heal after that," Holmes said. "But then I was drafted to the Ramblers." The Ramblers was Seattle's local team before the Seahawks began. The Rainier Beach Athletic Club became the Seattle Ramblers in 1950, and embarked on a historic run through semi-professional history accumulating a 108-46-3 record, including four undefeated seasons and two league championships, according to the Greater Northwest Football Association. Don Sprinkle, a longtime coach for Queen Anne teams and King County Sheriff’s deputy, was Holmes’ coach. It was an exciting time for sports in Seattle. The Ramblers’ first game was against the U.S. Navy Yellow Jackets on Oct. 7, 1950. The team also played the Butte Buzzies, Fort Lewis and more. Holmes married his favorite love, Shirlee Holmes, in 1953. Holmes enjoyed his minor football career for four years, until he had a tragic accident on the field. It was a match between the Seattle Ramblers and Portland State University, on a new field in Oregon. “It was a very new, muddy field," Holmes said. "And I'm a big guy with sharp cleats. I was planted in the turf." During a play, an Oregon player tackled a young Holmes from an awkward angle, and while a majority of Holmes went down, his left leg stayed planted in the muddy turf. “I felt a bad pain and looked down and saw I tore off my knee cap; it had slid down to my ankle," Holmes said. Holmes knew he couldn't play football anymore. He had a wife and a new family to support. “That was the toughest part of my life, getting over that," Holmes said. The team would play the 1963 and 1964 seasons, but the emergence of the Edmonds Warriors, who took many former Ramblers players, meant the team just couldn't compete in the changing semi-pro scene; the final game would be played at Portland. The Ramblers lost their final game of a 2-9 season and drifted off into history, according to the Greater Northwest Football Association. Holmes and his wife Shirlee still had a love for the game. Holmes had opened up his own athletic shop, Seattle's Athletic Award Company, in South Lake Union, back in 1949. They ran the company with their children while supporting local teams and keeping football fever alive in Seattle. When the Seahawks formed in 1976, Holmes made sure to buy season tickets. “I was over in Europe on vacation, but I made sure to call in," Holmes said. By 1990, when Holmes was 61, he and his buddy Dale Lamb came up with the idea for the Pacific Northwest Football Hall of Fame. “It started with a reunion banquet in 1990," Holmes said. “But we wanted it to be an annual banquet." The organization began with a 12-member board comprised of players, coaches and fans. Each year the board would vote for the best players and football leaders of the year. Soon a plaque listing honorees was hosted at the old Kingdome. Holmes participated heavily in the football scene for more than 10 years, and watched it change from the game he used to play to what it is today. The biggest change, besides the better protective gear, is the money. “It's so commercialized," Holmes said. "I think it's taken the gut fun out of some of the game. But I still love it." Holmes and his wife stayed with the hall of fame until 2003, when they chose to retire and spend time with their family and friends. Dave Enslaw ran the hall of fame from 2004 to 2017, and in 2017 the Seattle Sports Commission took the reins. Seattle Sports Commission executive director Ralph Morton said his organization worked with the founders to make sure the tradition stayed alive. “We saw something that would be a good opportunity if we put a little energy into it," Morton said. “It's really trying to continue a tradition. Looking at a long-term path of sustainability and moving it forward." Morton said the SSC chooses about five to seven honorees from pro to minor league players, coaches and leaders. “It becomes a broad section of the legends that have been around the region," Morton said. “Football really is a big part of our history." Holmes said he is happy to see the SSC take over the organization and hopes the list of names at CenturyLink Field keeps growing. After Holmes lost his wife a little more than a year ago, football memorabilia, family photos and mementos decorate his Magnolia home. For Holmes, football is still his second-greatest love. “It's just one of those things; a group of friends and you have each other's back. We played for the love, not the money."